David Goldblatt's The Ball is Round, an ambitious and laudably inclusive history of the game, weighs in at over 900 pages, and took me a few months to read, on and off. It deserves a lengthier review than most. John Foot, a noted football writer, reviewed the book shortly after it was released. Although I broadly agree with many of his comments, I can't share his gushing enthusiasm for the work as a whole. In parts, it is indeed informative, entertaining, and innovative. Yet there is a certain academia-inspired glibness about Goldblatt's social, political and economic ruminations, culminating in the wretchedly pretentious and inappropriate epilogue...on which more later. The early chapters of the book are, in many ways, the best and most enjoyable. Here Goldblatt simply tells the story of the game's early development, pausing only to stress its symbiotic relationship with industrialization and urbanization (which is undeniable). There are plenty of quirky stories, lovingly told, which keep the narrative chugging along nicely. Particularly interesting is the account of the fragmentation of the rules, with the "dribbling" version of the game eventually holding sway in most parts of the world...the main exceptions, of course, being North America and Australia. Unfortunately, Goldblatt's interest in the rules of the game is fleeting, and a significant omission in the later chapters is any discussion of the rule changes since the war. The issue of substitutions is not really dealt with, nor are developments in tie-breaking systems, the back-pass law, and the trials of the Golden Goal and Silver Goal systems, among others. Players, too, are given surprisingly short shrift by Goldblatt: depictions of the great exponents of the game, and their achievements, are often disappointingly brief. 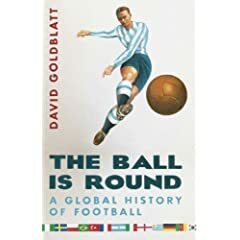 Instead, Goldblatt focuses intently on the intersection between football and society, and it is this relentless desire to place the footballing development of the various regions of the world in its political context which is both the book's strength and its weakness. We are constantly told of how a country's footballing rise mirrored its economic and/or social progress (by the end of the book, the reader will never want to hear the word "boom" again), yet these comparisons are often somewhat superficial. This is a game beyond metaphor. Its evil is real. Beneath the pitch in the impromptu holding pens and torture chambers are the remnants of Santiago’s radicals. Pinochet and his kind are not content merely to handicap their opponents, or subject them to systematic bias; they do not intend to play that game any more. They are going to eradicate the opposition altogether. The Chilean team and the match officials take to the pitch but the Soviets are not there. A smattering of people are on the terraces, but they make no noise. Many, heads in hands, do not seem to be watching at all. The touchline is ringed by impassive soldiers. The Chileans pass the ball among themselves before rolling the ball over the line. The game ends. These little inserted match reports work very well as a means of spicing up the book, and on the whole the ploy is realised well, although Goldblatt occsaionally gives way to flights of unnecessary purple prose in these parenthetical musings. Towards the end, sadly, the book goes off the rails. Factual errors and/or misrepresentations are rife, obsessive social commentary becomes the norm (at the expense of several other important elements of football history), and the book concludes with a ten-page epilogue which quickly degenerates into onanistic waffle. Instead of offering a measured appraisal of the state of the game in the early 21st century, Goldblatt gropes needlessly for an over-arching metaphor for the game, taking in religion, theatre and (again) politics. It is a shame that such an important and often illuminating book ends with pop sociology. The excellent first half of The Ball is Round deserved a better conclusion. I agree with your comments and it seems to be a problem with all the heavier books on the subject. They start with an enthusiasm to get things right and provide quality narrative and end up just wanting to get the thing finished. Commercial pressures, I suppose. I cringe badly when I find glaring factual errors and there are a few here, as you mention. Most of them are in the second half, if I recall properly, when things start getting a bit sloppy. Rather than getting an editor to read it, these authors need to get a football enthusiast to read it first. Yeah, like so many other books of its kind, I get the feeling this was rush-released to coincide with the 2006 WC. I don't doubt Goldblatt's enthusiasm for the game, but anyone can get facts wrong when they're in that much of a rush and have that much ground to cover. You're probably right though. I'm just about to hit the halfway of the book so it will be interesting to read the rest of it with your comments in mind. I haven't read Goldblatt's book, so I can't make the comparison, but for me till now anyway James Walvin's book The People's Game is the best hsitorical and social commentary on football's development. It's flawed but it's fantastic. Your review hasn't put me off reading The Ball...either. In fact I'm curious to read the onanistic waffle in the epilogue. I bought the book...then returned it!!! For 2 reasons, he dismissed Greece's victory in 2004 Euro with a metaphorical wave away of the hand. It was the biggest upset in Tournament history and provided many lessons (which I won't get into here). Secondly, because of the timing factor (I think), he was unable to provide commentary on the fact that Australia (of all nations) was the most entertaining team in the 2006 World Cup. P.S I still have my $30 dollar voucher!! Your criticism of the avoidance of the split infinitive is churlish and attention seeking. In this case it's necessary for precision of meaning. The book's a lot better than you make out. A book of over 300K words is inevitably going to flounder on a few inconsistencies. To be edited and read pre-publication to the extent that you require would have added at least 20 dollars onto the rrp. What you missed in your criticism is Goldblatt's poor description of the history of football in oz and his unacknowledged reliance on some of our local scholars. What a pleasure it is to read the words of someone capable of properly constructing a sentence! I fully agree with you Mikey. Nonsense. Point me to the ambiguity in "are not content to merely handicap their opponents...". The obsessive avoidance of split infinitives is an affectation, nothing more. There's no real linguistic reason for it, and more often than not it actually sounds clumsy. Side issue, anyway. "Attention seeking"?!? Perhaps true, but completely irrelevant to the review. A mistake is a mistake. Perhaps because I don't consider the story of Oz football exactly central to the history of the game as a whole. It'd be like assailing him for criminally biased and superficial coverage of Paraguayan football. ...What a pleasure it is to read the words of someone capable of properly constructing a sentence! I fully agree with you Mikey. Oh, you do tease, Mags.